The ox cart has always been the main means of transport and work in Gallura. 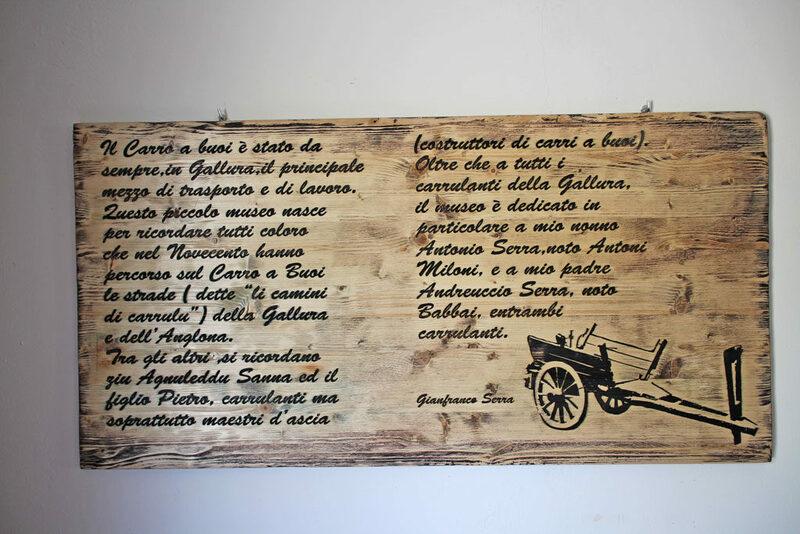 This small museum was created to remember all those who in the twentieth century have traveled on the ox cart the streets (li camini di lu carrulu) of Gallura and Anglona, northern Sardinia. Among the other uncle Agnuleddu Sanna and his son Pietro, carrulanti (ox drivers) but above all mastri d’ascia (builders of ox carts). On the top of a hill we saw a long line of carts, each pulled by a pair of you. The line stopped at the curve of the road, and in the pale light of that cold Sunday afternoon the pale oxen, the pale wagons, and the men who liquidated seemed a vision: a drawing of Doré. Voices and steps sounded sweet. Some peasants' carts came in, pulled by sleepy oxen, some men on horseback, some late wives who came back from washing their clothes to the stream. Shadows stretched across the white road, voices and footsteps sounding sweet in the soft, perfumed air. On certain bumpy roads the ox cart emits a creak, considered a good sign: it hunts the evil spirits and conquers the heart of the beautiful ones to the driver. Even today, when you encounter a particularly noisy chariot, it is said, with a ritual joke: ``Here's one who really wants to get married``. Choose a beautiful trunk of holm oak (liccia) or oak (chelcu), very straight perhaps with a slight curvature at one end, to get the tail of the cart slightly raised. The canonical length is equal to 5.10 m.
Break the trunk from the tail up to about 80 cm from the tip, where you place an iron ring (the loriga) to block the opening. The insertion of sleepers (traessi) of increasing length gives the trunk the typical triangular shape (la scala). The maximum throat width is 1.25 m.
On the tip (la puntetta) insert two wooden bars: a vertical (lu parapinnenti), acts as a support, and a horizontal (la capigghja) that serves as a handle for the yoke (lu ghjuali). Two transversal tables form the seats (li banconi). In them are inserted the side shoulders, formed by ” brazzoni e jacareddhi”. Below, at about half the space between the two “banconi”, there is a transverse axis of 1.05 m (lu fusu) in which the wheels are inserted. The wheel (la rota) is composed of circle and spokes entirely in wood. The tread is protected by an iron rim (lu cilciulu di farru). The wheel is fixed to the spindle by inserting an iron wedge (lu chjudittu) into its central protrusion (lu fiascu). The braking system (la meccanica) is composed of a stick that presses a wooden heel (lu taccu) against the wheel. Finally, the floor is obtained covering the internal length of the cart with long and flexible branches of ash (li ‘eltichi), woven along the sleepers.